It's the biggest iMac ever! Pinning down the iMac and who it's aimed at will always be a difficult job, seeing how effortlessly it doubles as both all-round entertainment centre and ultra-competent office workstation. You get everything for your cash: a powerful, well-organised desktop, a bright wide-aspect display and a reasonably easy- to-swallow price. Despite not having the depth of power of a Mac Pro, or the keen price-point of a Mac mini, the iMac will gracefully perform most tasks you set it, at home and at work. 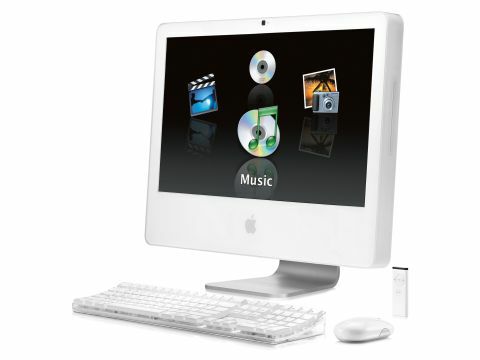 So the recent revamping of the iMac range certainly caught our attention. Now the family boasts four new siblings: two 17-inchers, one 20-inch and one jumbo 24-inch behemoth. The upgrades are in many ways expected, particularly the upgrade from Intel Core Duo to the more efficient Intel Core 2 Duo chips. But features we haven't seen on recent iMacs also make a welcome appearance. At last, Apple has allowed a degree of flexibility in its configuration options. You can now choose between different processor speeds when you buy and upgrade to 2.33GHz chips on three of the four machines. On all but the lowest priced 17-inch iMac, Bluetooth connectivity comes as standard, and you can configure graphics cards, expand hard drive capacity and bolster RAM to 3GB. Alongside the processors, the L2 cache memory has been doubled to 4MB, too - this alone is the biggest contributor to the new iMacs more responsive feel. But the real surprise in the new line-up is the whopping 24-inch display that comes with the top-end iMac. This machine comes with either 2.16GHz or 2.33GHz chips, a speedy NVIDIA graphics card options, and a FireWire 800 port for fast data transfer. That's all for the good, but the large display is, frankly, OTT. Up close, the sheer space can be daunting when you're just checking email or surfing around. But for photos and movie editing, it's ideal. Of course, its prime purpose is for movie playback, and the timing of this Mac's release with the recent unveiling of iTunes' movie-download facilities, is surely no coincidence. Using the Apple Remote and Front Row on this jumbo display is simply fantastic. When Apple's iTV box launches next year, and iTunes video content outside the US improves, this huge display will really come into its own as part of the household entertainment centre. For normal use (whatever that is), you need to actually push the screen back to view it properly. But the resolution and brightness are impressive for the price. It's 40% brighter than the nearest 20-inch model and that's per square inch, not just because the display covers more area. Resolution is a native 1,900x1,200 pixels, which is on par with a £780 23-inch Apple Cinema Display. The only complaint with an iMac of this size is that the taller front panel means you need to angle the iMac down to use the built-in iSight effectively and get your face in focus. We had to either re-angle it or half stand up to be seen properly in iChat. Connectivity-wise, little has changed - the ports are still around the back, although only the 24-incher enjoys a speedy FireWire 800 port. We still reckon Apple should shift the lot to the front or side of the iMac, so you don't have to reach around to plug in peripherals. Still, as it stands, the design is tidy. To date, the iMac remains our favourite desktop Mac, just because it's so versatile. The 24- inch display on this model is a little freakish, admittedly, but the upgraded graphics card and processor power it well enough. The more powerful graphics cards suddenly make the iMac a decent games machine, too.